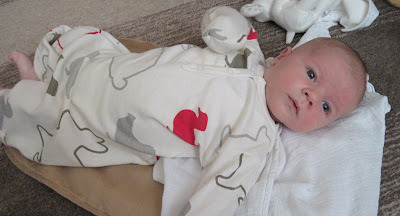 Nature Baby Sleeping Gown as modelled by my Noah! I was lucky enough to be offered the chance to receive a couple of the items that Natureshop sell in exchange for a review. The main baby products that Natureshop sell are organic baby clothing and bedding from Green Baby and Nature Baby. They also sell baby shoes as well as a large range of products for kids and adults. As I was expecting Noah I opted for a gorgeous sleeping gown by Nature Baby (see pic above) that has been extremely useful in Noah's early weeks. It is made from 100% organic cotton and what I've loved about it is that it's light for the warmer nights and also it has a drawstring at the bottom making nocturnal nappy changes nice and easy. It also has the fold down mittens on the sleeves to stop little nails making unsightly scratches on baby's face. The design is sooo cute and to be honest I'll be sad when he can't wear it anymore. I was also given the chance to try a pair of classic Birkenstocks, having never had a 'proper' pair of Birkenstocks before, it was really nice to try them and wear them on the few hot days we've had! They are perfect footwear for a mum to be, especially in the later weeks when your feet are all swollen!Both products were great quality and delivery was speedy. Being honest I probably wouldn't use the site to buy things for myself as I like to try and buy footwear when I'm in the shop but I would definitely buy clothing for my children through this site. The very fact that overnight shipping is free, returns are free and they are environmentally sound makes Natureshop really appeal to me. I could buy so many things for Noah and Isla (not to mention gifts for friends babies!) if funds allowed, check it out yourselves, you'll have the same problem. I was given the 2 items mentioned for free in exchange for this review. All opinions are my own.